This is believed to be a true story. Some years ago, an economist was chatting with a stranger in a bar. When the stranger was told that the man next to him was an economist, he asked an odd question: “So, what are the Two Things about economics?" The economist was puzzled. “You know, the Two Things. For every subject, there are only two things you need to know. Everything else is an application of those two things, or just not important," explained the stranger. The economist got it. “Okay, here are the Two Things about economics. One: Incentives matter. Two: There is no such thing as a free lunch." Touché. Tyler Cowen’s new book, Discover Your Inner Economist, is homage to the First Thing: Incentives matter. The writer has been described on the back cover once as the world’s best blogger and once as a contributor to the world’s best economics blog. There is only a hint of hyperbole in this. Cowen’s rare ability to marry insightful economics, crystal-clear writing and a bit of fun is on display every day at Marginal Revolution, the blog that he and several other colleagues at George Mason University have created. Okay, so incentives do matter. Economists use this basic insight to look at a variety of things—from why some countries are more innovative to whether obesity is because of the falling price of carbohydrates relative to the price of proteins. The other day, I read an interesting story in one of the newspapers. As part of their campaign against underage driving, Mumbai’s police have decided to impose fines not just on the kids behind the wheel, but also on those who own the cars—the indulgent parents and uncles who nonchalantly toss the car keys to their 15-year-old sons and nephews. They have less incentive to do so, thanks to what the police have done. 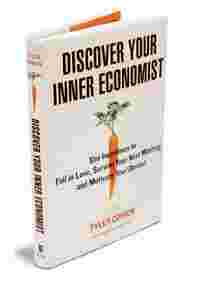 The beauty of Discover Your Inner Economist is that Cowen turns the spotlight inwards. The subheading of this book is: ‘Use Incentives To Fall In Love, Survive Your Next Meeting and Motivate Your Dentist’. In short, Cowen sets out to prove that economics can be useful in the most unlikely situations. Take meetings that stretch from here to eternity. We all seemingly hate them, but they envelop our working lives nevertheless. Cowen’s suggestions are very simple. There are several, but here are two. Make everyone stand during the meeting. That’ll keep the pointless chatter down to a minimum. Or, price everybody’s time. Each participant who comes into a meeting will key in his annual salary into the computer, which keeps a constant tab on the value of the time forgone. The person in the chair can ask at the end of the meeting, “Okay, we have spent $1,500 (approx. Rs59,000) of the company’s money. What have we learned?" Table talk: Conduct a meeting standing up, not sitting, says Cowen. There is, of course, a reason why meetings float on hot air. Participants want to send out signals—to their colleagues and their bosses. That’s another set of incentives at work. The interesting thing that you would perhaps have noticed here is that incentives and disincentives need not be monetary. Throwing cash around is a good idea. But there are other intrinsic motivations at work. And Cowen actually shows pretty convincingly that monetary incentives can backfire in some cases. Your kids will not help you with the housework just because you promise them a hundred rupees at the end of the chore. They seek acceptance, so a pat on the back works far better (I wonder why it doesn’t in my house). Discover Your Inner Economist will join the pantheon of a new genre of economics books that try to make the subject engaging and relevant. There have been several such books that have become popular over the past few years, such as Tim Harford’s The Undercover Economist and Steven J. Levitt and Stephen J. Dubner’s Freakonomics. A little-known classic in this genre, perhaps because it has not been published worldwide, is Ashok Desai’s utterly delightful The Price of Onions. Incentives are key to good economics. They can also be the key to a better—or at least a less confused—life. So here’s a question borrowed from Cowen’s book to check your own Inner Economist quotient: Should you give money to a beggar? And if not, how else would you spend it to help a needy human being? And why? Niranjan Rajadhyaksha, Editorial Pages editor of Mint, writes the column, Cafe Economics, every Tuesday.